Recently, a new trend called ‘DIY Braces’ surfaced and began trending online. At first glance, it may seem convenient and cheap. Cute, even. Youtube videos advertise this method comes with a significantly less upfront cost, less time, and seemingly perfect results…all without setting foot in an orthodontist’s office. As it turns out, the harm is really, really serious. DIY braces, at best, are a risky health move. At worst, however, they can cause serious health consequences. Your local orthodontist urges you to reconsider what you’ve seen on Youtube- and look at some of the major concerns. Look, nobody is trying to be cruel here. Just honest. Your local orthodontist understands teeth and gums. They understand it really, really well. In fact, they may have attended up to eight, rigorous years of schooling focusing on what’s happening with those pearly whites. Do you really have any idea what’s happening underneath your gums? Or about the bone density around the root? Guess what? Your local orthodontist does! Personally, these risks don’t sound all that appealing. More than that, they don’t seem worth taking- at all. Tooth damage can be irreparable- is that something you really want to deal with for the rest of your life? Let’s say the best-case scenario actually happens, and you pull off flawless teeth via Youtube tutorials. Congrats, right? Not so fast. Moving teeth too quickly (and without supervision) can cause tremendous strain, which can lead to the teeth moving right back to where you didn’t want them. Your local orthodontist doesn’t just assist you with braces. He or she is also considering the aftercare. This often means custom, long-term retainers (which require their own equipment and training to manufacture). Are you able to do that on your own? As mentioned, your local orthodontist strongly, strongly warns you against the dangerous DIY braces trend. Obviously, braces can come with a steep price tag. They represent a financial investment. 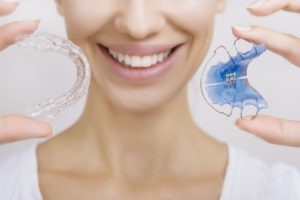 And, yet, the long-term financial consequences that can arise from a botched DIY braces stint may far surpass a one-time braces fee. This hurts your teeth. It hurts your wallet. And it hurts your time (yep, even more time at the dentist). On all fronts, it seems like a major lose-lose. Remember, as humans, we are blessed with just one set of adult teeth! Do not take them for granted. Your local orthodontist is trained to take care of them at the utmost professional standard. Take their lead, and get the smile you want (without all the potential scary risks and consequences). Find Your Local Orthodontist, Now! Alborzi Orthodontics offers a variety of different orthodontic treatment for helping you make the smile of your dreams. Schedule a complimentary assessment today!